Testimony of the crashing ocean. Just back from a day off with friends at the famous Coptic Orthodox Monastery of St Mari Mina. Out in the desert about an hour south of Alexandria, the Monastery is a huge compound with lots of churches dedicated to St Mina, and is full of cheerful bearded monks, and lots of folk coming to walk, pray, worship and eat holy bread, especially on Fridays and Sundays. It’s expanding too, with building work all over the site, with new visitor centres, retreat houses, the usual shops with icons and crosses etc, but mainly with new churches for worship. St Mina (sometimes known as Menas) is known as the Wonder Worker, and the place is full of depictions of him – the saint who turned to God wholeheartedly, lived out in the desert, became a Christian martyr, but whose life is still appealed to by the faithful. There are many stories about his life and death, which the Coptic Orthodox brothers and sisters hold dear, as my friends do. On one of the websites telling me all about the place there is a section named ‘Miracles’, which gives a long list of extraordinary happenings around the site, in the name of the saint and the power of God. These are recorded happenings from the past, but also declare that miracles are happening now. Lots of testimony about the power of God. I might not go the whole hog in terms of devotion to the saintly men and women of the past, as some traditions do…but this I know…we still need miracles, and we still need that testimony. We still need living saints of God to live out lives of holiness, power, courage, bravery, strength and faith, and we still need miracles of God to transform lives, heal the sick, change hearts towards peace, hold back evil, address injustice, intervene in situations that look impossible. We can only do so much ourselves. The rest is the grace and miracle of God. Let’s keep walking, praying, worshipping and eating holy bread, like cheerful monks – and let’s keep praying for miracles. Day 1: The chaotic queue of the displaced. All screaming kids, and tired parents, waving yellow paged documentation at the officials. Waiting their turn to be recognised. Day 2: The dutiful queue of those expressing their condolences. All lined up in black, family receiving the sad handshake in the sunshine. Shiny coffin in the 4×4. Day 3: The anxious queue of the prison visitor. Hour after hour shuffling, pushing and then sitting…waiting to be called, ID in hand. Bags and gifts all ready to be searched. 3 days. They queue. We queue. A little thought is about investment. It begins after church yesterday in the warm morning sunshine (oh yes! ), with a chat to a very friendly chap who is American/Egyptian and works in business investments here in Cairo. Interesting when you are in a stable situation, but when you are in an ever changing and still rather volatile country, it seems to be not just a risk, but an act of faith to be in that line of work. What do you invest in, and why? Then up pops Tom Clark who has arrived in the dead of night from Alexandria, and booked into the Cathedral guesthouse two doors away from me. I wondered who was making the racket arriving at 02.00am. Over here with a colleague, and involved in an Alpha conference in Alexandria, Tom was one of my part time BA students, (and very successful too…obviously) and now has a posh title as Alpha Relationship manager based at HTB, London. Cries of ‘what are you doing here?’, from both of us, and then drinks later in the day to catch up. A brilliant, if not slightly surreal, moment. But great to hear about what he is doing….as it always is when I hear from my beloved ex students who accomplishments I am always proud of. The encounter also made me think about personal investment. Who do I invest in, and why? Last night I was able to pass on some collected gifts to a local family who live in quite a poor situation, and this morning chatted with the new co-ordinator of the prison ministry who Micah68 supporters have gathered some monies for. Again, a sort of personal investment into things hoped for, but not yet realised. So what, and who, do I personally invest time and energy, and maybe even money into? And why? A risk? An act of faith? An investment in a changed future? Just pondering…. There’s lots of ways of saying ‘ hello’ out here in the Middle East. Some formal, some informal, some for particular times of the day, some depending on whether a male, female, stranger or friend is addressed. Sometimes a bit confusing. One of the nice things, is that there is usually a response and often a type of blessing back. One Arabic phrase ‘nice to see you’ which literally means ‘happy chance’ has the response ‘I am happier’. Apparently (courtesy of Fuzz Kitto) ‘hello’ in indigenous American Sioux means ‘I see you’. Not in any threatening way……it acknowledges that the two people are present together face to face. Not quite the same on social media I guess. The response means ‘It is good to be seen’. Now that’s an interesting thought. Yep, I can see you……but isn’t it ‘good to be seen’? Some folk of course are seen rather too much (I think here of the vacuous state of ‘reality TV stars’ – but maybe even they need to be seen for a reason). But what about those on the margins, the street beggar outside M&S, those queuing at the food banks and the Salvation Army hostel, the Big Issue seller……? Surely for them it is even more ‘good to be seen’. Thinking about this idea all day, whilst I walked and taxied around Cairo using my poor Arabic I have made the point of stopping, and saying ‘hello’ in a more deliberate way. Shaking hands with street cleaners outside the guesthouse, acknowledging security guys outside the refugee registration hall, jabbering away to the taxi driver about the state of the cars until we were both laughing and it was a shame to get to the destination (neither of us understood a word each other was saying by the way), almost high fiving (something I never do!) the whole staff as I left Beano’s for serving me a coffee. Much nonsense. But guess what? I felt my ‘hello’ meant something, and hopefully for those guys, it was good to be seen. Over to you dear reader, to translate. It is good to be seen. Micah68 is the personal Christian ministry of Ian White. 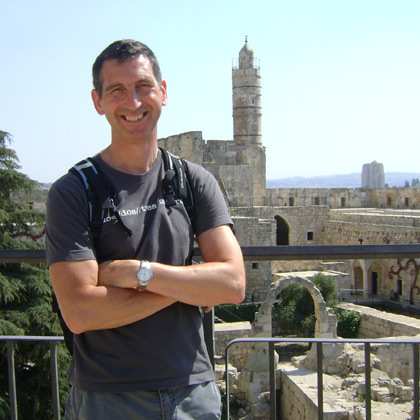 I have over 15 years of mission experience in the Middle East, and have travelled to the region over 50 times, taking volunteer teams to Israel, Palestine, Jordan and Egypt on 25 occasions. I am especially experienced in offering short term mission opportunities, and believe that extending real friendship and practical active support offers the best context to allow the good news of Jesus to be expressed. I have a concern for the poor and disadvantaged, hate to see injustice, and believe that Christians need to speak up and speak out when they encounter it – as well as do something practical to respond to the issues.